Are Old-Growth Redwoods (Functionally) Extinct? Home » Giant Thoughts » Redwoods Futures » Are Old-Growth Redwoods (Functionally) Extinct? A new research study published in Nature (found here; and excellent summary is here) got me thinking about the work we do to restore redwood forests. 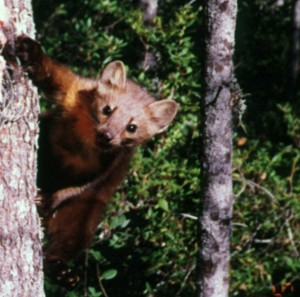 The Humboldt marten is one species that’s threatened by old-growth forest loss. Photo courtesy US Forest Service. A functionally extinct species may still exist, but no longer acts as part of an ecosystem. These functional extinctions are more likely in larger animals and those higher up the food chain (presumably because there are fewer of them and so each individual matters relatively more), and can occur after a decline of as little as 30% of the original population. This gets me wondering – does the same hold true not just for species, but for groups within species, like old-growth forests? Redwoods themselves aren’t extinct; they aren’t even close. Old-growth redwoods, on the other hand, cover only about 5% of the area they did in 1850. This may appear at first blush just to be a trick of demography; it’s all redwood, right? Not so. Ancient forest functions quite differently from young forest. Many species cannot survive without the structures that only time can build, and who require the deep stillness of old forests far from human commotion. With such a small proportion still in existence, can the remaining old growth still provide the habitat these species need? While the trees themselves might remain, could the ancient forest become functionally extinct? The small area of ancient forest that remains is made still smaller by the fact that the ancient forest that does remain is often isolated in small remnant pockets, far from other forests like it and surrounded by altered landscapes whose influence pervades and degrades it. Thanks to the work of the League and its many partners and supporters over the last century, much of the remaining ancient redwood forest has been permanently protected, and we are working hard to save as much of the rest as we can. But, saving just the ancient forest will not be enough. We are beginning to see the decline and loss of some of these creatures – such as the Humboldt marten – who can not persist in the fragments that remain. How long until the ancient trees can no longer perform their role in the ecosystem they define? The good news is this: unlike true, numerical extinction, functional extinction can be reversed. If a species (or ancient members of a species) can recover, it may regain its functional existence and once again become members of the ecological community. This is one important why we work to restore forests as well as protect them. The ecological existence of old-growth redwood depends on it. Richard joined the League’s staff in 2012 as the Conservation Science Manager. He brings nearly a decade of experience in forest management and restoration.